There Will Be No Flashing Green Light, OK? I was talking with a friend this weekend while up in San Francisco and we were discussing what we wanted to do in the future. A lengthy talk about buying houses, starting families, getting completely out of debt, owning a business and assorted other things went on for a few hours. However, towards the end of the evening we both kind of looked at each other and said “why wait?”. Seems that the two of us, along with probably most other people, have a long list of things that we want to accomplish in life but we are always waiting for the “right time” to make it happen. And we realized that the “right time” for a lot of the things we were talking about was never going to come along because of extraneous circumstances. 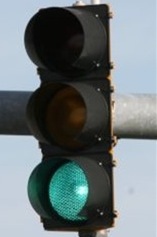 There will be no flashing green light telling you when to make your move. For most things in life, no one will tell you when it is the right time to do X, Y or Z. Sure, we are sometimes hindered by what is going on around us…finishing school, slowly paying off credit card debt, etc.. But a lot of what you want to accomplish could be started today and no later. I think we all fall into the trap of “I will do that when I…”; I know that I fall into that trap as well. But really, there is no time like the present and I am going to really start applying that to my everyday thoughts and dreams. My wife and I have been discussing starting a family a lot lately but we keep pushing the date back for different reasons; we want to move first, my wife wants to finish the school year first, I want to take on a few more clients. But I am no spring chicken (although she is :-)) and the longer we wait for this, the older I will be when my kids are still hanging around the house. We desperately want to move to Taos, NM but still haven’t…for some of the same reasons listed above. It might not feel like it, but putting off your dreams and/or ideas is only going to hurt you in the long run. I am not talking about things that you really cannot make happen right now because of some certain circumstances. I am talking about the things that you could be doing but you aren’t because you are waiting for the perfect time. I will let you in on a secret…there is no perfect time for most things that you want to accomplish. My friend in SF has made some progress on this front as he already has a 2 year old when, according to him, they weren’t really “ready”. But a medical issue forced them to be ready. His wife stopped working her job to take care of their child and even though they did not know how they could afford to live on one salary, they made it happen. Now they are about to have baby #2 and again, they are worried about making ends meet with an extra mouth to feed. But instead of hemming and hawing about it, my friend is busting his a** to find a new job in a new city where he can make more and afford a house and a yard. They did not want to leave SF yet; in fact they wanted to stay there forever. But circumstances change and they have to go with what will work for them. But having kids is not really what we were talking about because, well, he already has them. His real dream is to own a bar/restaurant and instead of waiting around until the kids are grown or his life is more stable, he is going to start working on his dream right away after our talk. Great read:) This is the attitude we all needed. My say is future is the illusion, past is the past, now is everything, act now. Really excellent post. Too many of us (myself included) who are concerned about finances are always waiting until we’re just a little bit more prepared. There are no guarantees that life will just continue without interruption, so sometimes when you want things (a family, a home, a move, a new job) you just have to do it. I have delayed forcing myself to get a new job for more than a year now, for example. And you’re right, there will be no flashing green light telling me it’s time to hit the exit. Having the balls to go forward when we need to is so crucial to success. Great post!